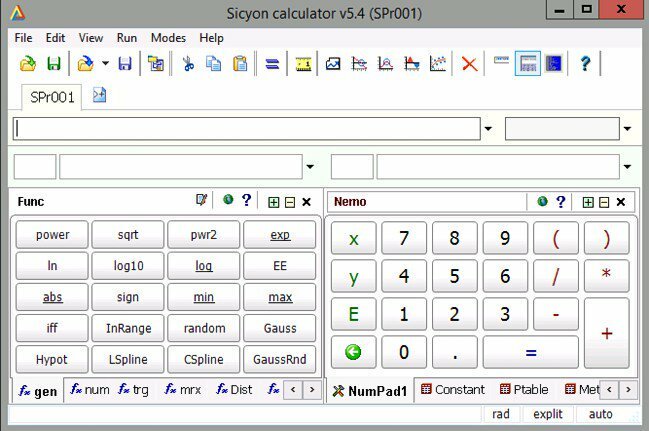 Sicyon is an all-in-one scientific calculator for every student or professor, researcher or developer – everybody doing physics or chemistry / science or engineering using formulas and tables of constants. It is easy-to-use and has everything you need to calculate or investigate a function – chart, roots, min/max, integral, derivative, fit data over, etc. Sicyon calculator combines an intuitive interface and an object oriented approach to provide a fast learning curve while staying at a high level of efficiency. ‘Program mode’ allows you to execute script code in the main window. searchable tables with various physical and chemical constants arranged in data boards (~50 of them). "plug-in" additional applications called tool boards, usable as objects in the script. plot / tabulate a function in Explicit or Parametric mode. Draw many curves / surfaces on the same chart (multi-chart). You can combine 2D and 3D graphs, with data from user data boards or the clipboard. projects’ collection of curves and surfaces (more than 100 of them). find definite integral in 2D and 3D of an expression in a given interval. In 3D – partial derivatives (∂/∂x, ∂/∂y and ∂²/∂x∂y) with chart. fit batch of data sets to the same function and gives the fitted coefficient results and batch statistics in a table. fit more than 3300 functions over a single data set and present the list of the best fitted functions with their coefficients. customizable (template based) HTML reports for all math procedures. use matrices and matrix calculations. context help on any level of organization – function buttons/ boards/groups.